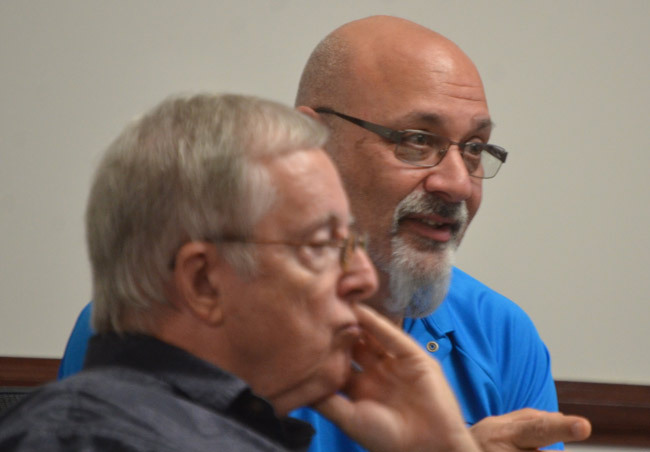 For Palm Coast officials, when it comes to litigation between the city and Dennis McDonald, it’s personal. And by city officials’ own acknowledgment, it can cloud their judgment. “This is about making the city of Palm Coast look like a bunch of idiots,” said another council member (Bill McGuire, who’s since left). “And I don’t think we are,” Nobile said. “This” was a $9,000 settlement the city agreed to pay two years ago, through its insurer–or seemed to have agreed to pay: the council never took a vote and never announced its decision in an open meeting, as it is required to in any settlement. In that case, the council only gave directions to its attorneys, in a closed-door meeting (from which the above exchange is quoted), to go ahead with a settlement with McDonald, who had sued the city after tripping over a sidewalk crack on Clubhouse Drive. McDonald is suing again, this time for $120,000, after yet another trip and fall, this one at the city-owned Palm Harbor Golf Club days before last Christmas, a fall that required a hip replacement for McDonald. He’s represented by Jim Manfre, the former sheriff. It’s the third time he’s suing the city. The first suit was tossed and the city sought and won an $8,000 payment from McDonald to earn back its legal fees. By the time he filed the second lawsuit, he and the city were in frequent verbal duels over one issue or another, and the city was not interested in settling. McDonald’s methods as a serial filer of lawsuits and other forms of civil actions against local governments and officials have been repeatedly documented, and the record has repeatedly shown that, trip-and-fall suits aside, his legal steps have more often been frivolous than not, and his aims have, as Nobile pointed out, seems inspired mostly by the fight for its own sake. Along the way, however, governments at the other end have portrayed themselves as victims of his maneuvers, objectively battling to protect taxpayers’ interests. That’s not entirely what the record shows, now that the details from a closed-door meeting can be revealed: the city at one point considered battling McDonald at great cost and at great risk of losing–and the council had instructed its attorneys to do just that, until an insurance adjuster and a judge had other ideas. Only then, when faced with stark numbers and an iffy case, the city council pulled back, more in surrender to its adjuster than in agreement. But that strategy now appears to be a template that may dictate how the city deals with McDonald’s latest lawsuit, and how McDonald himself may respond. In April 2016, the city council, with City Manager Jim Landon and two attorneys, held a closed-door session to discuss what to do with McDonald’s lawsuit, filed a year earlier. Government boards may hold such secret sessions as long as they limit their discussion to legal strategy–not to decision-making. A judge had ordered mediation, and the city’s insurance adjuster had agreed to a $9,000 settlement. But that was against the council’s previous guidance: the council did not want to settle, and was willing to go to trial if necessary. The substance of that closed door meeting, disclosed here for the first time after FlaglerLive obtained a transcript, points to the degree to which matters had gotten personal with McDonald, and may indicate the strategy the city adopts in this latest lawsuit, though costs may be heavier this time. It is clear from the transcript that the only reason the city settled is because even if it had gone to trial and won, it would have had to pay its attorneys at least $30,000 of its own funds. If it had lost, “we don’t know where we will be,” its attorney had cautioned, “ because the damages could be anything.” But council members had for a time seemed willing to take that risk. Barbara Babb-Nutcher, a Palm Coast city attorney who handled the McDonald case, had found 400 awards of between zero and $50,000 in such cases, but had also found 36 cases in the $2 million to $5 million range. “So the point I’m trying to make is: there is really no way to predict what a jury would do with a case like this,” she said. The $9,000 settlement was not actually out of city funds, at least not directly, but paid out of its insurance through the Florida League of Cities Insurance Trust (to which the city pays hefty premiums out of its own funds). McDonald in the first trip-and-fall suit had first demanded $95,000, though his opening demand at mediation was $65,000. The council didn’t want to settle. But the judge ordered mediation and the insurance company pressed for a settlement, though it kept telling McDonald that it would go to trial for anything above $15,000. The issue in the closed-door meeting was whether the council wanted to expel its insurer from the negotiations and take over the issue–meaning go to trial–and the associated costs. 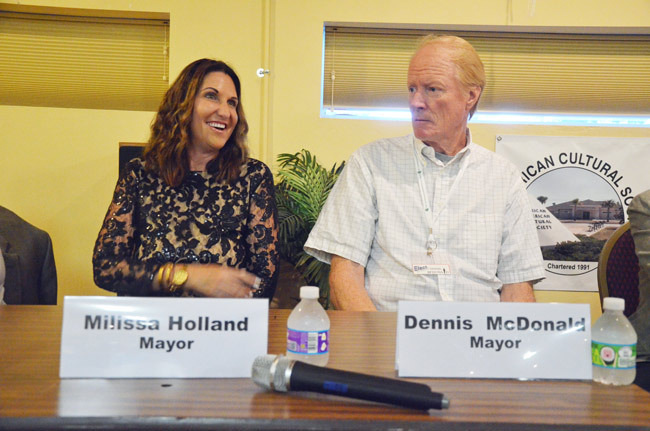 “So being as fair as I can be, it’s our personal feelings about [McDonald] in this case that are influencing our decisions,” then-Mayor Jon Netts said during the closed-door session. Council members were concerned about precedent: settling with McDonald would risk inviting more lawsuits. “We’ve done this for other people, and the world has not come to an end,” Netts said. That may be the case elsewhere, but the record shows it has not been a problem in Palm Coast (an indication in itself that the city’s sidewalks have not been a problem area): a check of the circuit court’s docket for 2016 and 2017 shows the City of Palm Coast named in just 11 civil actions, none of them involving trips and falls, all of them involving the city only peripherally in property related issues. In 2015, the city was named in 30 civil actions as a defendant, all but five involving foreclosure-type property issues. Of the remaining suits, only three involved negligence. One of them was McDonald’s. Another was auto-related. Trip-and-fall suits, in sum, are very uncommon. “That and $4 gets you coffee,” Netts snapped. 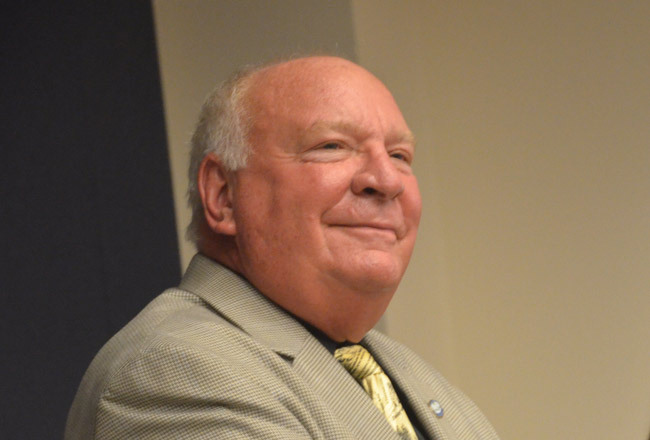 The mayor may have been right: the city’s inspection program was not as rigorous as the attorney portrayed it, at least not in the words of its one inspector at the time of the McDonald fall: in a deposition, when that inspector–who is no longer with the city–was asked if his responsibilities included sidewalk inspections during that period, he replied: “It might have. Our schedule was so busy and random at the time that I can’t actually isolate that time period. … Because at times, I would be pulled off one job and put on another.” He also noted that some years he did more inspections than others. The inspector would inspect while riding on a Gator cart. “I would go slow enough to where I could actually get a good visual on the concrete and its structure and whether or not there are areas that are falling,” he said (keeping in mind that he was blind in one eye). Some areas he would inspect on foot. As to the area where McDonald fell, the documentation of the inspector was not so precise as to show whether it had been properly inspected. “Do you know whether the area where Dennis tripped was noted on your spreadsheet on the January 2013 inspection?” the inspector was asked. “No, I do not. I do not know that,” he replied. “No, I cannot. I cannot because it’s just too vague,” the inspector said. That closed-door session took place at the end of an April 19, 2016 council meeting. The mayor announced it properly to the extent that he said who would participate, that it involved litigation, and that it would last about 45 minutes, give or take. But he did not mention the actual name of the case or identify the litigation, as he was supposed to(it was identified on the agenda only). “The settlement of a case is exactly that type of final decision contemplated by the drafters of section 286.011(8) [of Florida law] which must be voted upon in the sunshine,” a Fourth District Court of Appeal decision often quoted in such matters ruled in 1999. The Palm Coast council did not do so. In essence, the settlement that was conditional on council approval was never approved officially. Now the council gets to go through the same process again with McDonald’s latest lawsuit. I don’t know how the parasite can show his face around town. Pleeeeeease let me be part of the jury for this scammer, I mean, valued citizen. One of the reasons we can’t have nice things and insurance has gotten so expensive is because of sue happy people. I’m all for a person honestly wronged getting justice and compensation but it’s getting out of hand. Take for instance the automobile industry. You have whole firms who are “attorney’s for bikers” and are just waiting like vultures for a car to hit a bike. I drive 400 miles a week thru various bike hot spots and can tell you that bikes cause a lot more violations than you think. Today in Daytona we had the green light going South and a group of 6 ran a turn signal and violated right of way in order to stay together. Had one of us hit them Rue And Ziffra would have been all over it. Then you have the medical industry. If you have taken medicine A there’s a law suit for it. If you have symptoms B or disease C there’s a law suit for it. If you pass gas in a crowded elevator you can be sued to !! Again all of these law suits have a price for innocent people having nothing to do with it. I believe that if you are a chronic suer and your claim is denied and found unjustified then you should be held liable for fees. Why should my rates go up because you want easy money?? He falls a lot,maybe the money would be better spent on a physical therapist. Since he has a history of falling, Palm Coast should use that as part of their defense. He’s clumsy, he kniws he is clumsy, and he assumed the risk. I’m sure if the sidewalk was too smooth he would have used that as an excuse to fall as well. He probably isn’t done yet. If he wins money in this lawsuit he should invest in bubble wrap and wear it at all times. In my opinion it demonstrates a lack of self-esteem and dignity to publicly announce that you are prone to trip on cracks in the sidewalk. Next time administer a breathalyzer test! The inspector rode in a cart and is blind in one eye, and the city thinks this is good. Everyday I’m reminded just how much this city is run by a bunch of morons. A sore loser, who has too much time on his hands. Pay the man his money, because if this goes to court the city could lose millions instead of this little 120,000 or so. Stop playing “Vendetta Politics” before you get the taxpayers in Palm Coast Burdened with a big settlement against the city to be paid for by we the taxpayers. DUH!!! This should be the last time he sues. Stipulate it in the final settlement.